The large bur oak (Quercus macrocarpa) can reach 70 to 90 feet in height and 60 to 80 feet in width. This tree is native to North America and grows in USDA Hardiness Zones 3 to 8. Prune bur oak trees to control their size and keep them healthy. Wait until the late winter or early spring to prune, and work on an overcast day to avoid stressing out the trees from heat or sun. Prepare a cleansing solution of 1 part bleach to 10 parts water in a bucket. Place your pruning tools in the bucket. Note any dead, diseased or damaged branches on your oak tree, which need to be removed for the health of the tree. Dead branches feel hollow to the touch. Damaged or diseased ones appear scarred, wounded, discolored or otherwise marred and are markedly different from healthy wood. Prune off the dead and unhealthy wood, cutting it off at its base or cutting back to a lateral branch. Use anvil pruners for thin branches and lopping shears for those thicker than 1 inch. For limbs larger than 4 inches in diameter, use a hand saw. In between every cut, place your tools back in the cleansing solution to disinfect them. Clip off low or downward growing branches that impede movement under your bur oak. Also clip off suckers growing from the tree trunk or out of the site of past pruning cuts. Remove branches that crisscross or rub against other branches, since this creates wounds. Prune off up to one-third of the old branches in a given season to thin out the canopy, increasing light and air circulation. Remove branches that grow too close to vertical (those that make tighter than a 30-degree angle with the trunk), since these interfere with other branches. Head back long branches to control the bur oak's size. Clip them back to a lateral branch, making your cut at a 45-degree angle. Consider hiring a tree trimming service if you have a large bur oak, since you won't be able to reach its upper branches. 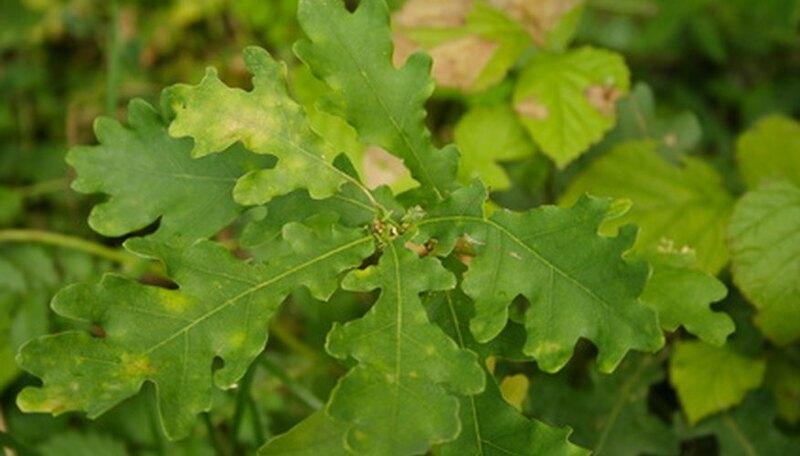 Avoid pruning oaks in April, May or June since this can attract beetles that spread oak wilt. If you must prune in those months, the University of Minnesota advises applying wound dressing to mask the cut wood smell that attracts those pests.